Dragon*Con was four days of zany geekiness with 30,000 of my closest friends. Today kicks off my recap of celebrities, costumes, events, friends, swag and more! 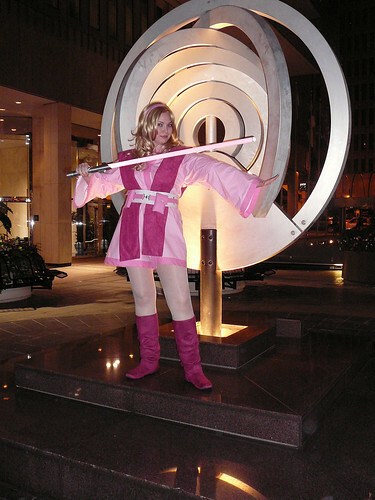 While I’ll cover a lot, this is only a fraction of what took place during Dragon*Con 2009. At certain times, there were as many as 50 different simultaneous sessions going on! This program was astonishing! Last year’s Dragon*Con was so amazing, I didn’t think this year could hold a candle. Well, I was wrong. This year was as good as, if not better, than last year! One of my goals was to take more pictures this year. In 2008, I took a little over 400 decent pictures. This year I managed to take over 800 pictures, with over 600 of them worth keeping! If you want to check out my pictures, they’ve been uploaded to Flickr and THE UNIQUE GEEK photo gallery. Additionally, I’ll be featuring some of my favorites here over the next few days. The hardest part about coming back from Dragon*Con is re-acclimatizing to regular life. After complete immersion in the geek-lifestyle, it’s hard to readjust to “normal” people. Just imagine four days surrounded by people with similar interests and that understand every vague reference you can imagine; phrases like the following are understood by everyone there: Docking Bay 94, Ootini, Kobayashi Maru, Red Shirt, Can’t stop the signal, It was a bad call Ripley, Pwned, My Precious, Pre-Crisis, or It’s Clobberin’ Time. You can’t help but get caught up in the experience. It’s like an affirmation of everything geek. It’s like Christmas for adults! My flight into Atlanta arrived around 9am. Serv got there just before me, so we caught up in the airport. We hung around for a bit waiting for our friends Holly and Race. We grabbed a beer (remember it’s only 9am) agreeing that it’s only alcoholism if you attend meetings. Holly arrived on-time, but no Race. Huh? Yeah, super-punctual Race missed his flight. Race-less, we grabbed the MARTA and headed to our hotel. After getting off at the Peachtree station, we knew we were in the right place when we saw someone dressed up as the Mad Hatter and an overweight guy in a Star Trek costume. Bingo! We’d arrived. Immediately after checking into the hotel, I went to get my Dragon*Con badge at the Sheraton (most sessions have Dragon*Con staff checking for badges). The line for pre-registration badge pick-up was about three hours long. Aaaarrrrggghhhh! I was really bummed because I was gonna miss some panels I wanted to attend. Thankfully someone informed us that certain lines up front were vacant. It appears the majority of people checking in had last names starting with A, B, or S. So I side-stepped the rest of the line and walked right up. In-and-out in five minutes! I guess that makes up for the 45 minutes I had to wait last year. Sadly we missed the William Shatner/Leonard Nimoy panel. I’ve heard it was great! There is some video available online, so I’ll be sure to check that out later. I quickly zipped over to wait for the Torchwood panel. 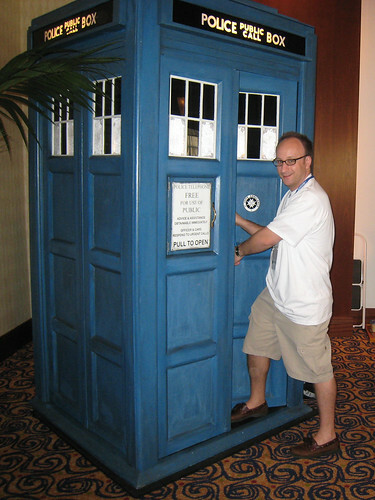 While there I got my picture taken with a life-size TARDIS replica from Doctor Who. This thing was amazing! The owner handed me the key, suggesting I unlock it and step in just like the Doctor. There was a sound system inside playing the background hum of the TARDIS as well as the occasional Cloister Bell! Totally cool! The owner explained they have different windows and decal treatments to emulate the different eras of Doctor Who (as the TARDIS has changed slightly over the years). It’s currently decked out to appear as the TARDIS 11th Doctor Matt Smith will be traveling in. In addition to touring with the replica TARDIS, the owner also sells Tom Baker scarf replicas that she knits. I still have my 12 foot scarf my Great Aunt knitted for me back in the 1980s. We talked quite a bit about the different scarves worn in the show and the efforts she’s going through to ensure accuracy. Really neat lady. You should check out her website, the WittyLittleKnitter.com. 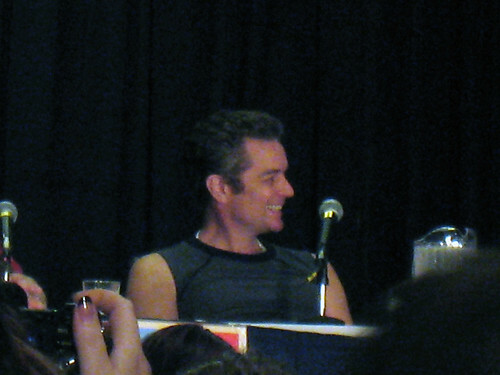 The Torchwood panel was pretty good. 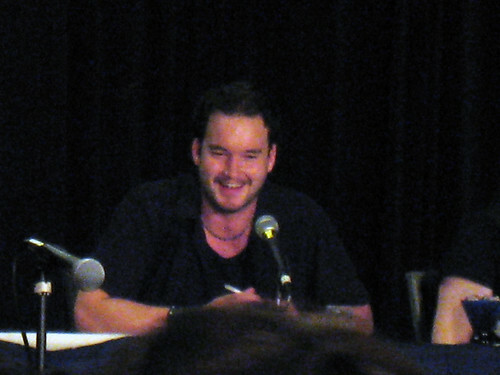 It featured Gareth David Lloyd (Ianto Jones) and James Marsters (Captain John on Torchwood and Spike on Buffy). Last year these two did the same panel together, so there were several rehashed stories. If I hadn’t attended this same panel last year, I probably would have enjoyed this more. New stuff included some good discussion on ramifications of the recent “Children of Earth” storyline, as well as some unrelated anecdotes from Marsters. All-in-all it was a good panel and I’m glad I went. Next up was the Avengers Symposium on Assembled 1 & 2 in the Hyatt. The first 30 minutes was an interesting literary analysis of the comic book super-team the Avengers and the Assembled books by Van Allen Plexico. 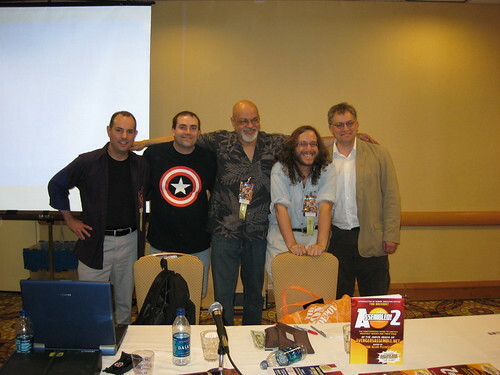 Then it turned into a Q&A session with Van, George Perez, Keith RA DeCandido, George Kopec, and Joe Crowe. Great panel! 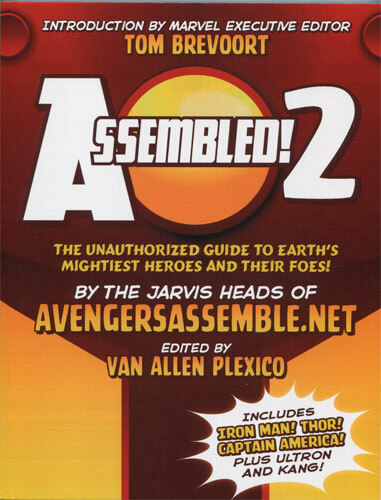 This was also considered the book release for Assembled 2: The Unauthorized Guide to Earth’s Mightiest Heroes and Their Foes, so I purchased my copy and got the whole panel to sign it. Hooray! 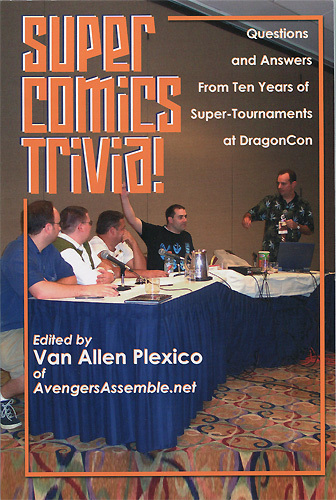 Also on sale was Super Comics Trivia!, a book containing questions and answers from ten years of Van Plexico’s comic book trivia tournaments at Dragon*Con. Surprisingly, I’m on the cover of the book! Seriously, I’m not kidding! 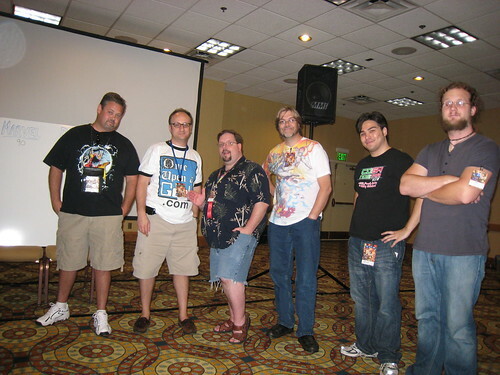 I was lucky enough to participate in one of Van’s Marvel/DC Comics Jeopardy tournaments a few years ago. Someone happened to take a picture of the game and that made the cover of the book. Interestingly enough, Van posted this picture to his website a few years ago. I jokingly asked if he could color in my bald spot. For the cover of the book, he did! If you look closely you can see where they colored in my bald spot! LOL! Thanks, Van! You can order both Assembled 2 and Super Comics Trivia from Amazon.com. I’m the guy closest to the camera in the blue shirt below. The back of my head is on Amazon.com! I’m famous! 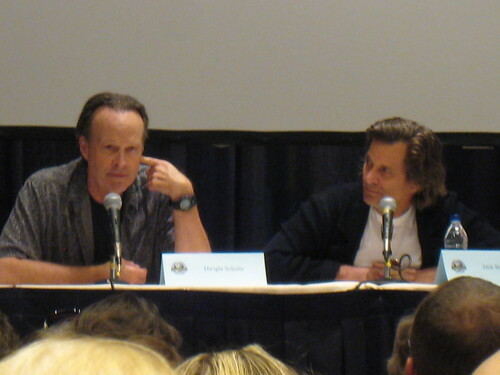 After that was the A-Team panel featuring Dirk Benedict (Faceman on A-Team and Starbuck on the original Battlestar Galactica) and Dwight Schultz (Howling Mad Murdock). They really had chemistry and were lots of fun to watch. They were definitely old pros on the convention circuit and knew exactly what would get the crowd cheering. They had some really funny and surprising things to say about George Peppard and Mr. T. I’m glad I made the time for this panel. Then I hit artist’s alley. My goal… to get an autograph from George Perez on an old Flash comic featuring a Firestorm back-up story he drew. When I arrived at Perez’s table, turned out he was doing head sketches! Awesome! In addition to signing the comic, Perez sketched Firestorm for me! In the Assembled panel, Perez mentioned he always likes to add something extra when delivering an art piece. I’d asked for Firestorm, so he took the time to add in an “extra” of Professor Stein’s astral head! To see the Firestorm sketch you’ll have to watch future posts on my other blog, FIRESTORM FAN.com. Needless to say, George Perez was super cool! The last event of the evening for me was in the comic book track, Marvel vs. DC Family Feud. The host, Van Plexico, changed the format this year from the usual Jeopardy to Family Feud, which allowed many more players to participate. He selected returning champions and finalists from previous years, so I got to play! On our team (dubbed the “DC” team) was my good buddy Michael Bailey (from Views from the Longbox and Fortress of Baileytude), a Dragon*Con acquaintance Mike Stewart, another Dragon*Con acquaintance named Michael, and two other guys named Michael. Seriously, on our team there were five guys named Michael and one guy named Shag. And if you know me at all, then you know how ironic this really was. On the opposing team (dubbed the “Marvel” team) was our good friend Choco Taco, publisher Lars Pearson, and four other blokes. It was a close contest with some unexpected survey results, but in the end our “DC” team triumphed! The rest of the night was spent hanging out with friends and taking copious amounts of pictures. Sadly around Midnight the battery in my camera died. I was just about to snap a picture of Barbie Jedi when it happened. Aarrggghhh! Sadly I never got the picture, but thanks to the wonders of Flickr, I found that someone with the online handle Charfade did get her picture. Sometime around 2am or 3am we all retired for the night. In our room was Serv, Ravenface, Choco Taco, Race, Jon, and myself. Six guys all packed into one hotel room. It’s no surprise that what happened next can only be described as THE WAR OF THE SNORE! I believe I have permanent hearing damage from the racket we created with our snoring. 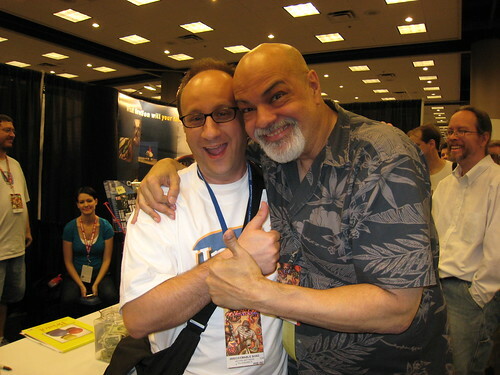 A hug from George Perez is like getting a hug from God! Missing out on a chance to get a picture taken with the TARDIS makes me cry deep, soul-wrenching sobs over not going to the convention. Ah, well. Lesson learned. I was at the Nimoy/Shatner panel and it was fantastic! The two of them had us laughing the entire time. Sorry you missed it. Did you know what DragonConTV replays some of the big panels on their hotel channel? IF you’re in any of the hosting hotels, you can find the “convention” channel. I think that is one of my favorite parts of DCon. It’s like a constant barrage of geek jokes and skits, interspersed with the big name panels. Every time I was in my room, that channel was on. Never was a big fan of Dragon*Con TV. I got that they were trying to be funny, but often times it just kind of comes across as forced or just shy of full-on bwa-ha-ha.